Buddhadev Bose (1908-1974) would have been 100 this year. Buddhadev Bose was, not only a prominent and prolific poet, but essayist, playwright and critic. Bose was the founding editor of the first Bengali-language poetry journal called Kavita, or Poetry. In India, he was widely seen as the literary successor to Rabindranath Tagore, the first non-European to win the Nobel Prize for literature. 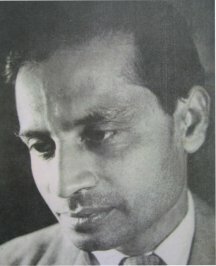 Bose was a major organizing force in 20th century Bengali poetry. He was a founding member of what is called the post-Tagore modernist (or adhunik) generation—a Bengali modernism which reflected a shift away from Tagore’s idealism toward more urban and secular themes. they were cosmopolitan and heavily influenced by Western literature, Bose particularly with Pasternak, and later Baudelaire and Holderlin. Politics was an inescapable reality for Bose’s generation. He was a member of several left-leaning groups in the 30’s and 40’s, but later felt that "what had been conceptually liberal turned into various hardened ideologies." (Dyson). Frustrated by poets that lapsed into what he felt was "political cacophony." (AGG, 25) he had a growing sense of disillusionment, then frustration, with some Bengali poetry of the late 1940’s and beyond. On one hand seen as hard-working and sincere, he also had the reputation for being uncompromising and stubbornly stuck in his ways. He distrusted the "poetry of the moment" and longed for a verse that was "conceived in the soul" (AGG 68). His poetics valued a perfection of craft and intentionality and included a distrust for political content and formal experimentation. He had a deep passion for Bengali literature; and to spread awareness and appreciation for it, he sought encouragement for the frustrating task of translating his work into English. Although he was fluently bi-lingual and heavily influenced by Western literature, he felt that self-translation into English was a nearly absurd task. He wrote to George Oppen at one point that he did not, "believe that foreigners can use the language of poetry, and the best we can do will remain pale approximations." A collaborative effort with Oppen would result in two transcreations, which appeared in Oppen’s book, The Materials. Buddhadev Bose, taught in the States from 1963 to 1965. He returned to India to face what was called the Hungryalist Movement in Bengali poetics a force that was more akin to American Beat poetry than Bose’s post-Tagore modernist (or adhunik) generation. He eventually found an English translator in Clinton Seeley, a University of Chicago Peace Corps alum, who meticulously translated Bose’s novel, Rain Through the Night—a novel brought up and acquitted of obscenity charges in 1969. Bose was an uncompromising, tireless and versatile writer whose efforts helped lay the foundation for Bengali poetry publishing and cross-cultural exchange. 1908: Buddhadev Bose was born on November 30 in Kumillah, East Bengal (now Bangladesh). 1949: Publishes Ezra Pound’s Confucius: The Unwobbling Pivot and The Great Digest in India through Kavitabhavan. 1963 – 1965: Buddhadev and Protiva Bose in the U. S.. Buddhadeva teaches first at IU in Bloomington, IN , then at Illinois Wesleyan University in Bloomington, IL. 1969: Prosecution on obscenity charges for Bose’s novel, Raat Bhore BrishhTi (Rain Through the Night), a frank account of marital infidelity. 1972: Protiva, disabled due to a bad reaction to a vaccine. He wrote a number of novels: Laal Megh (1934), Raatbhare BRishhTi (1967), Paataal Theke Alaap (1967), Golaap Keno Kaalo (1968). Short story anthologies include Abhinay, Abhinay Nay (1930), Rekhaachitra (1931), Bhaaso Amaar Bhelaa (1963). Bose was also a playright. Notable plays include Tapasbee O Tarangini (1966) and Kolkatar Electra O Satyaasandha (1968). Still considered by many contemporary poets as the most significant Bengali poetry-essayist, Bose's essays are anthologized in Kaaler Putul (1946), Saahityacharchaa (1954), Rabindranaath: Kathasahitya (1955), Shbadesh O Sangskrti (1957). Travelogues and memoirs include - Hathaat Alor Jhalkaani (1935), Sab Peyechhir Deshe (1941), Jaapaani Journal (1962), Deshaantar (1966), Amaar Chhelebelaa (1973), Amaar Jouban (1976). Buddhadev Bose was at the same time a prolific translator. His translations include Kalidaaser Meghadut (1957), Charles Baudelaire: Taar Kavita (1960), Rainer Maria Rilker Kavitaa (1970) etc. He also wrote for children. A fair amount of his articles are in English, An Acre of Green Grass being the most discussed book. In 1967, Buddhadev Bose received the Sahitya Akademi Puraskar (Academy of Indian Literature Award) for his play - Tapasbee O Tarangini. In 1970, the Government of India awarded him the "Padmabhusan" . He received the Rabindra Purashhkar (Rabindra Award of the state government of West Bengal) posthumously for his book - Sbaagata Bidaay (1974). Jesus was director of a philanthropic foundation? Or Buddha the babbling, balding, amiable president of an NGO? Than in galloping away after the grail. There is nothing out there; draw the curtain close. Those are only to lull you -- grass, dirt, puddle, sky. Not that your potted plant, pet songster are any less false. Fall into yourself, sink into your own black hole. No Tao can teach you what you don‘t already know. Get used to this daylong donkey’s toil of crafting rhyme. Winter casts its anchor; what need to wait for more? Hours, gongs, bells, changes merge into one. Your own unmoving sun and earth and moon on the page. Golden apple, is there a reason why you are? Small; - but beyond knee-deep water was the storm. A game; - but leading upto voyages. And the animal's cave is closed. No bribes can open the door. Reduced to a worm is the tiger's redness. No more the warm wet flow of the stupid child. A raw lump of feeling slow to learn.